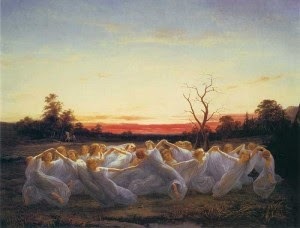 In Norse paganism, Light elves were beautiful creatures and were considered to be “guardian angels”. The god Freyr, was the ruler of Alfheim, the home of the light elves. In terms of hierarchy, Light elves were minor gods of nature and fertility; they could help or hinder, humans with their knowledge of magical powers. They also often delivered an inspiration to art or music. Light Elf Magic. You know the Guidance cantrip. When you reach 3rd level, you can cast the Speak with Animals spell once per day. When you reach 5th level, you can also cast the Spike Growth spell once per day. Charisma is your spellcasting ability for these spells.